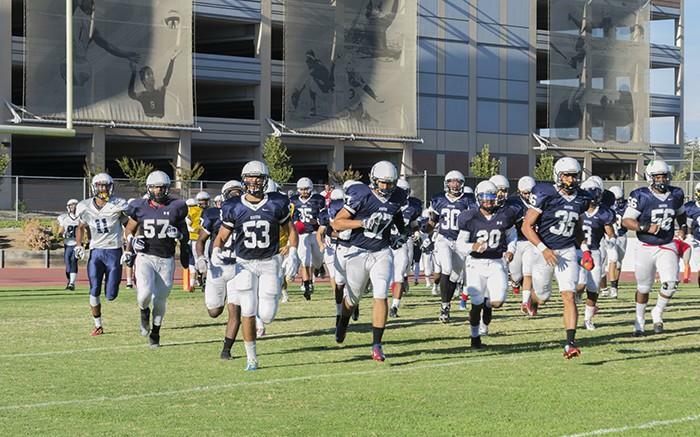 American River College’s football team got one final game simulation on Saturday, as the offense scrimmaged the defense only a week prior to the team’s season opener at Modesto Junior College tomorrow. Head coach Jon Osterhout said the team and coaching staff treated the entire day as if it were a regular season game day, including afternoon meetings and a pregame meal. The team has been together since training camp started in early July and has improved greatly in its understanding of play calls, though still showed signs of rustiness during the scrimmage. Three personal foul calls were assessed to the defense, two of them being facemask penalties. On the offensive side, holding penalties were a continuous problem and were issued throughout the game. “We need to do a better job of managing the football and giving up long plays,” Osterhout said of the kinks the team needs to work out in the coming days. Despite that, Osterhout said this year’s team has come together quicker than he’s seen before, which he largely credits to the continuity and camaraderie of the coaching staff. “Schematically in all three phases, we’ve installed the bulk of our schemes. The continuity of the coaching staff has allowed us to implement schemes quickly,” he said. Freshman running back Greg Scott had two big runs in scrimmage, while quarterback Connor Zari got the most reps running the offense. Scott is a redshirt player this season, while Zari is grayshirt. Scott said the reason he came to ARC is because he heard that it’s a good school. He said he thinks he’ll be of use to the team when he gets a chance to play. Zari said his time during the scrimmage was to test himself and give the coaches film to dissect from. Osterhout spoke of the team’s depth for both this year and next despite having multiple players sitting the season out. Sam Kiel, the team’s starting kicker, struggled in the scrimmage, missing two field goals late while getting hardly any lift on the ball. Osterhout isn’t concerned about Kiel’s difficulties, and said he simply needed more practice. “I mean, he was our starting kicker last year, we just need to get him more repetitions on the live field,” he said. The team plays at MJC in its season opener, and players and coaches alike are excited to get the season started. Osterhout specified winning on special teams, third down, turnovers and the red zone as keys to the game for ARC. Be the first to comment on "Scott and Zari impress in scrimmage as team prepares for season opener"